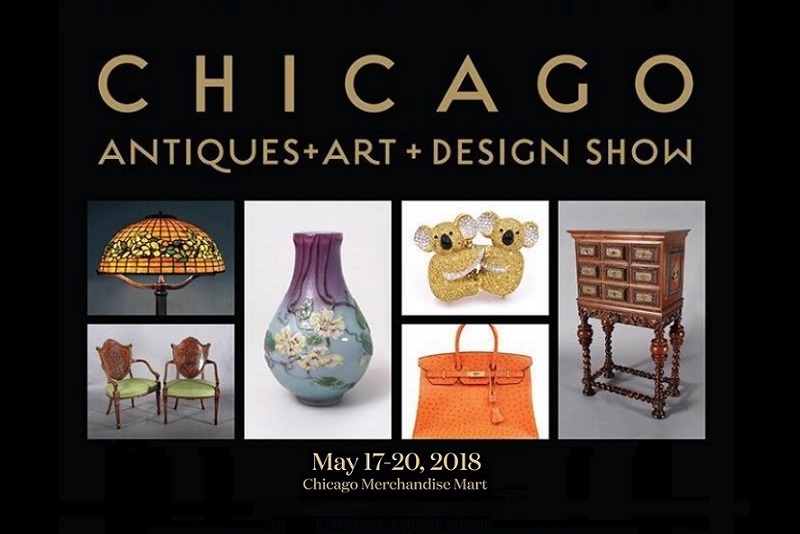 The Chicago Antiques + Art + Design Show returns to the renovated and historic Merchandise Mart in the heart of downtown Chicago on the 7th floor over the weekend of May 17-20, 2018. The show features 75 premier exhibitors from across the U.S., Europe and South America presenting furniture, decorative and fine arts from ancient to 20th century modern, silver, paintings, porcelain, folk art, Oriental rugs, antique and estate jewelry, vintage clothing and accessories, ceramics, Art Nouveau, Art Deco, rare books, lighting, Native American artifacts, map and prints. Please visit the website for a list of vendors and information about the event. The Chicago Antiques + Art + Design Show will open on Thursday evening, May 17th from 6pm to 9pm with an opening night party benefiting the Woman’s Board of Northwestern Memorial Hospital. The opening night party will offer cocktails, hors d’oeuvres, complimentary valet parking and the opportunity for serious collectors to shop the show before it opens to the public. All ticket proceeds will benefit the Woman’s Board and offer return entry all weekend along with a show catalog. Buy tickets for the Opening Night Party. The Woman’s Board of Northwestern Memorial Hospital is dedicated to supporting the programs and services provided by Northwestern Memorial Hospital, including those related to women’s health issues, and to the furtherance of Northwestern Memorial’s mission as a premier academic health system where the patient comes first. The Woman’s Board is proud to continue its historic role as the leading support organization for Northwestern Memorial Hospital and as advocates for improving the health of those served by Northwestern Medicine.